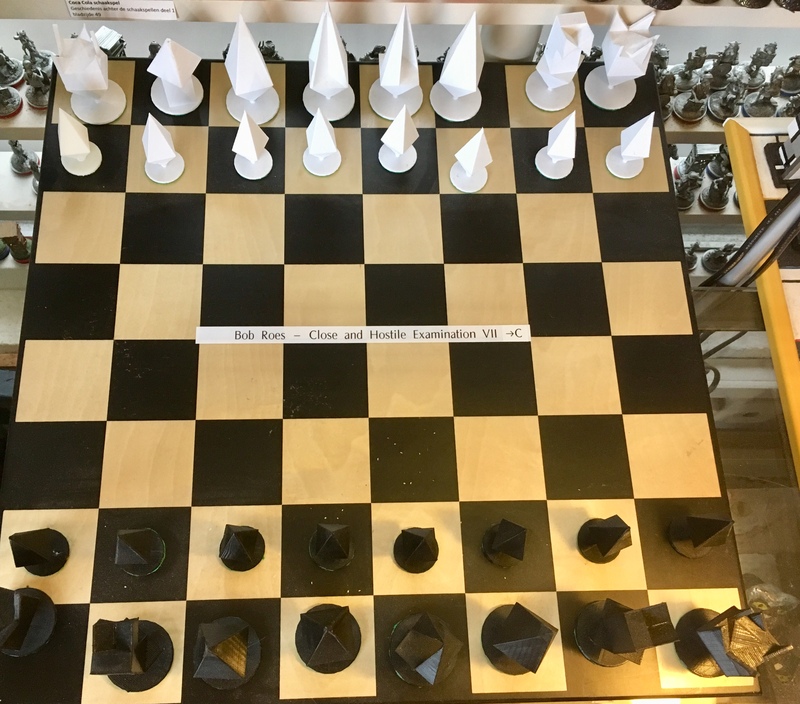 In 2018 there were six handcrafted chess games on display in the Chessmen Museum. The visitors of the museum could vote for their favourite game, which resulted in a total of 595 votes. On 1 January 2019, we finally find out who the winner is. Sixth place goes to Alex Brouwer. He managed to collect 70 votes with his ‘Organic’ game. The wooden chess pieces come in very ornate and imaginative shapes. It is a little difficult to see what the chess pieces represent though, making it more of a game to put on display than to play with. Zyon Kollen finishes in fifth place with his ‘Rainbow Chess’. The creator of this colourful game was unable to (clearly) convey its message: the pink side has two queens and the rainbow side has two kings. 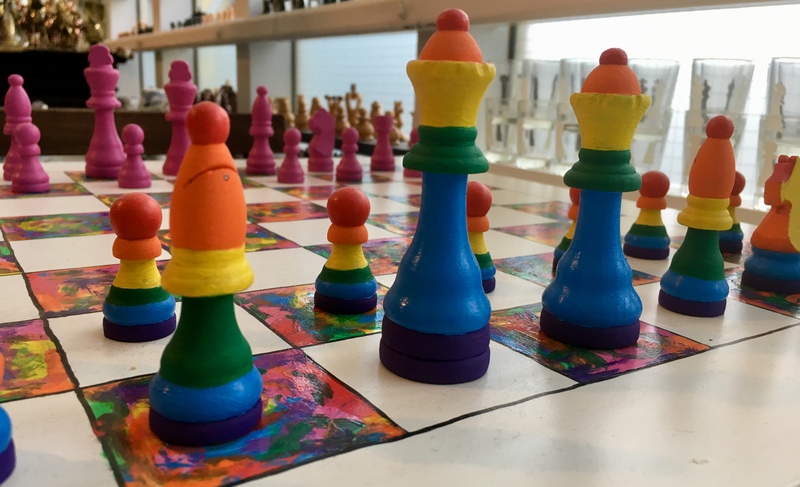 The statement of this gay chess game has unfortunately escaped the attention of many visitors. Zyon got 72 votes. The last rider of the peloton is Gaëlle van den Dool. She takes fourth place with her ‘Drips Chess’ chess game. She received 77 of the votes for her colourful and chunky-shaped creation. 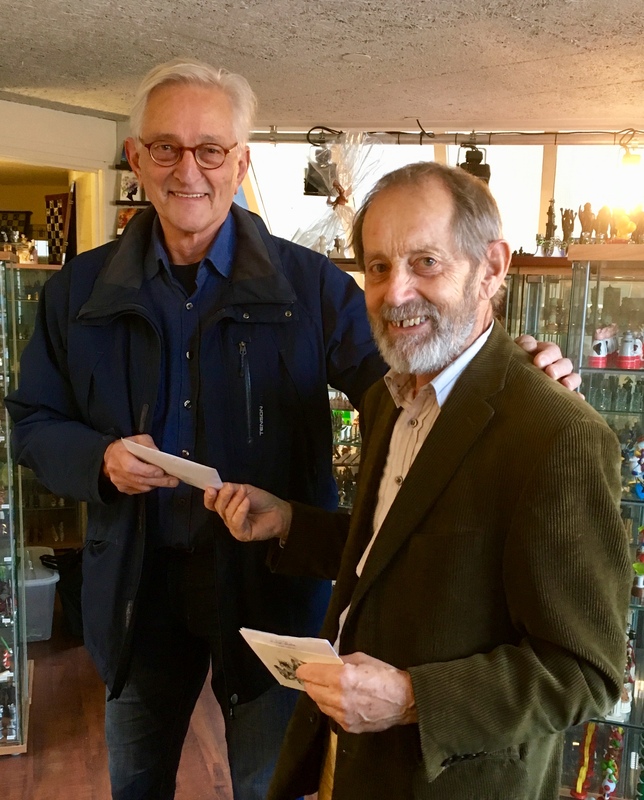 Ahead of the peloton, there are two sprinters: The ´Stained Glass´ chess set by Frans Mellink, and ´Close and Hostile Examination VII´ by Bob Roes. Both chess games received 107 votes. During a round of voting among the attendees, Bob Roes´ chess game doesn´t receive any extra votes and ends in third place. The ´Stained Glass´ chess set wins the sprint and receives second prize. 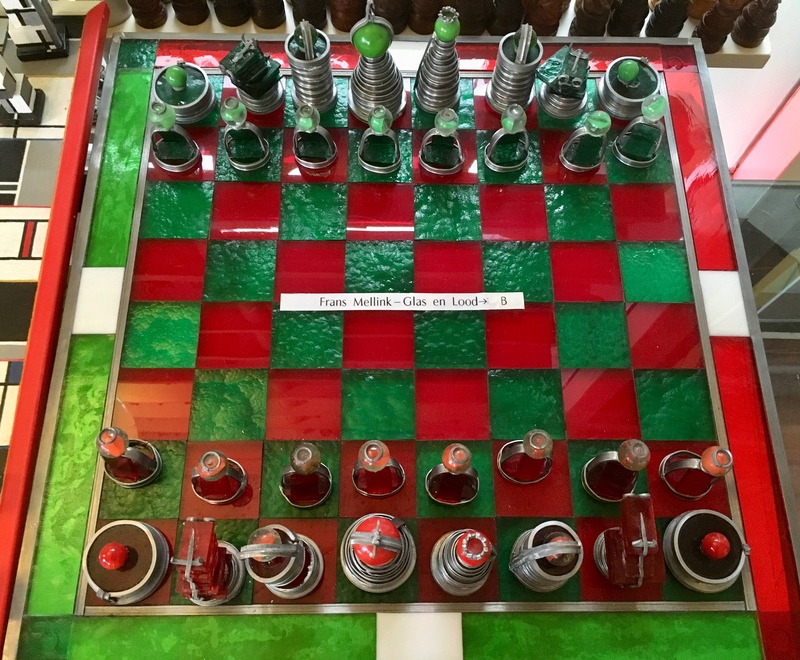 Both the chess pieces and the chessboard are made of red and green glass. 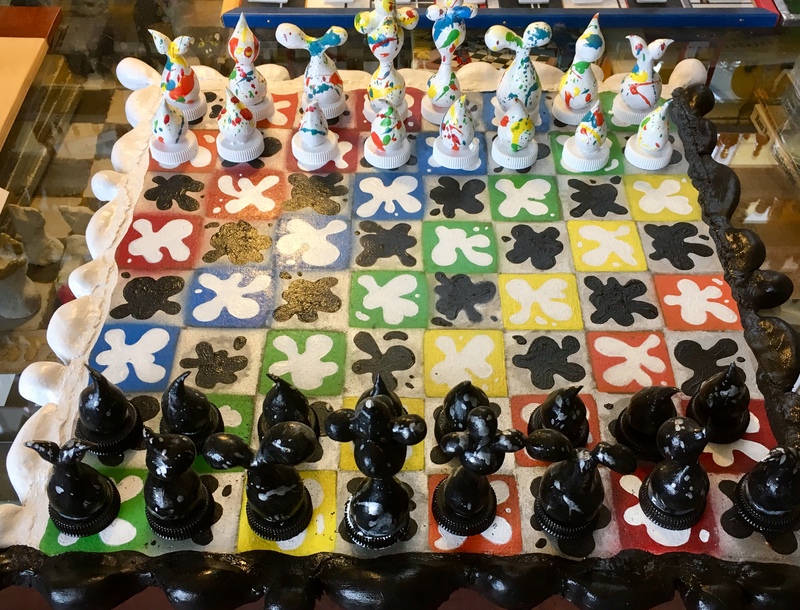 The frame of the board is made of lead, the board itself has a red and green chequered surface, and the chess pieces are made of twisted lead, decorated with red or green glass. A true work of art and a justified runner-up. The final sprint has, at the same time, revealed the winner of the race: the leader in the Chess Game Design Competition is Jan de Visser with his ´STYLish´ chess game. Over a quarter of the visitors, as many as 162, rewarded this game in the style of The Style with their votes. This makes Jan de Visser the undisputed winner and he is handed the first prize of €1000,- by Ridder. This is the third time that Jan de Visser enters the competition. After conquering a fourth place twice, he is now very satisfied to have come in first. It took him months of work to finish his wooden chess game. De Visser, a native of the city of Leiden, was inspired by the celebration of the Style Year in 2017. The art movement The Style made its first appearance 100 years earlier, in Leiden. 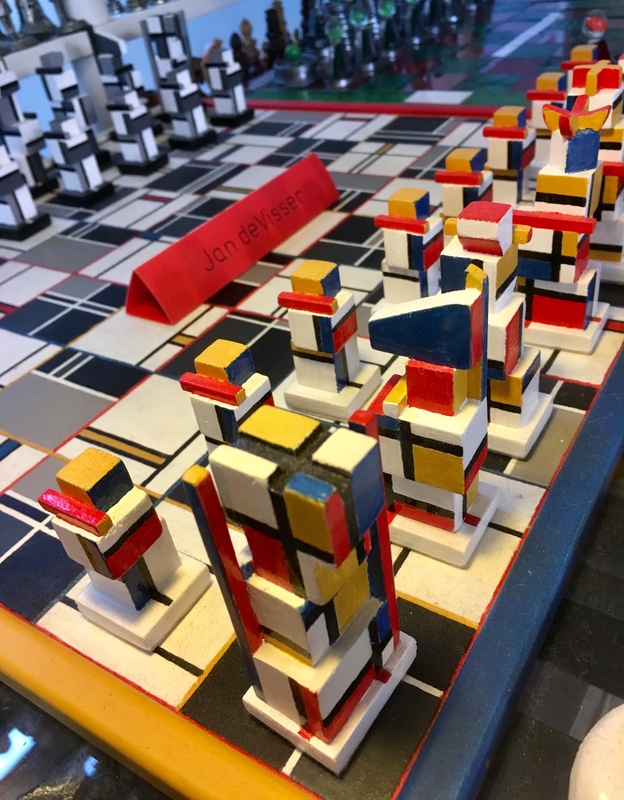 “I love Mondriaan and Rietveld and I have incorporated this love in my chess game. Everything about the pieces is symmetrical and the squares on the chessboard are tiny Mondriaans”, says De Visser proudly. The result is worth all the hours of hard work. Not only according to the designer, but also according to the visitors who cast their vote. A visitor from France was so impressed with the game that he wanted to buy it from the museum. That was impossible, of course, because it was part of the competition. “Ridder put me in touch with this visitor. In the end I made him an exact copy of my design, which is now in France!” says De Visser. We can´t wait to see his creation for the next competition.